Image caption President Islam Karimov, 78, has died after suffering brain haemorrhage. The departure from the helm by Uzbekistan's long-serving President Islam Karimov is likely to have wide-ranging repercussions for the region. 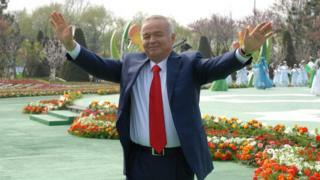 The Uzbek government announced his death on Friday after a period of rumours about his ill health. As is often the case with strongman regimes, no tried and tested succession mechanism is in place in Uzbekistan, and the transition of power may well be a complicated process. Uzbekistan is the most populous Central Asian country and has the largest army. Mr Karimov, who came to power during the Soviet era, has led the country since independence in 1991. During his long rule, President Karimov has built a relatively stable secular regime in a region threatened by Islamist radicalism. But many believe this has been done at the expense of human rights, and has often been an excuse to hound legitimate opposition. It also has not completely eradicated the long-term risk posed by Islamist militancy. Many Uzbek Islamists have simply dodged the tight security at home by fighting for the Islamic State group abroad, but should the secular government weaken, they might be tempted to come back. Some also say that Uzbekistan's fractured and exiled opposition may turn to Islamism to boost its appeal in the majority Muslim country. Positioned on the ancient Great Silk Road between Europe and Asia, Uzbekistan enjoys a strategic location that has attracted the interest of many foreign states throughout its long history. Most recently, it has been one reason why Russia and Western powers have been vying for a foothold. Image caption Russia and Western powers have been vying for a foothold in Uzbekistan politics. In 2001, Uzbekistan allowed the US to use its air bases in support of military action in Afghanistan, but four years later all foreign troops were evicted following Washington's criticism of the Uzbek government's human rights record. Moscow will be keen to ensure that Mr Karimov's successor leans towards Russia rather than the West. So far, unlike most Central Asian countries, Uzbekistan has been wary of Russian influence. In 2012, it withdrew from the main Russia-led regional military bloc, the Collective Security Treaty Organisation. Political instability caused by Mr Karimov's demise could be felt far beyond Uzbekistan's borders. The country is rich in natural resources, including oil, gas and gold, and any turbulence may push up the price of these commodities on world markets. Tension could could also spill over into Uzbekistan's energy-rich neighbours, Kazakhstan and Turkmenistan. Image caption The country is rich in natural resources, and any turbulence may push up the price. Regional transport corridors may be disrupted, including gas and oil pipelines running to Russia and China. Uzbekistan also supplies electricity to Tajikistan, Kyrgyzstan, Afghanistan and southern Kazakhstan. Uzbekistan lies on key opium routes from Afghanistan to Russia and on to Europe, and drug smugglers could take advantage of instability to distract or disrupt law-enforcement efforts. President Karimov has never been shy of deploying his powerful security apparatus to exercise a firm grip on power. This, among other things, has enabled him to maintain a delicate balance between the various ethnic groups inside the country. Should it be upset, the ripple effect may be felt as far away as in China. Uzbekistan hosts a sizeable Uighur community, and the predominantly Muslim Uighur minority in China has long been seen as a source of concern by Beijing. President Karimov's successor will also inherit unresolved border differences with Tajikistan and Kyrgyzstan.